Hold onto your hats, Odyssey fans! 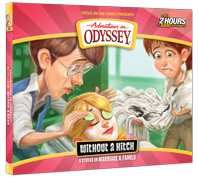 The newest collection of Adventures in Odyssey episodes is now available for download. Album 61, Without a Hitch, can be purchased and downloaded from a variety of different places. 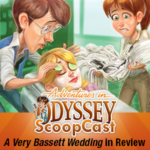 You won’t want to miss the latest Adventures in Odyssey collection which also includes a behind-the-scenes bonus feature on the making of the episode A Very Bassett Wedding. You can view more information and find download links at our product page. Alternatively, you can subscribe to the Odyssey Adventure Club and access the entire album, plus the entire series… and then some! For those of you who are waiting for your CD copy, stay tuned. That’s scheduled for an October 2016 release! In case you haven’t noticed yet, Focus on the Family has launched its own online store. You can now purchase resources—including Adventures in Odyssey audio CDs, books, DVDs, eBooks, downloads etc.—directly from Focus. And when you purchase directly from Focus, all your money spent supports Focus on the Family. In the past, they had partnered with Christian Book Distributors to make resources available, but now they are shipping items directly. Of course, we had sprinkled tons of links throughout our website over the years, and we will be trying to get things up-to-date around here in the coming days. For now, you can access a link to the Focus on the Family Store at our Links page.